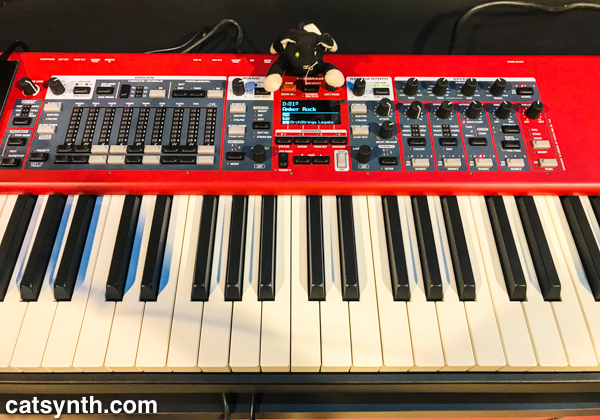 We resume of coverage of the 2018 NAMM Show after a few days break – and a nasty bout of “NAMMthrax” – with the latest spin on an old favorite: the Nord Electro 6. Longtime readers know that I have been a user of Nord keyboards since I got my trusty Nord Stage EX back in 2010. It has served me well, but have sometimes been envious of the features in subsequent generations, notably the expandable Piano Library and Sample Library (the original Stage does not support the sample library at all). 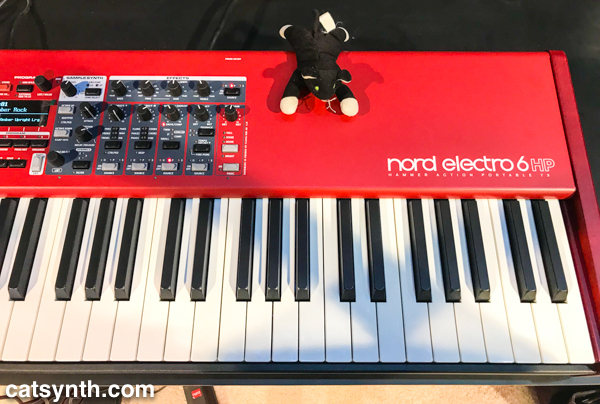 With the Electro 6, the separation from the Stage line is much more blurred, and it calls into question the need for a Stage at all for those of us who fell in love with Nord keyboards for their electric pianos. The Electro 6 supports up to 3 layers and splits (something previously limited to the Stage). The electric piano (and acoustic piano) section is enhanced with new layering features and its own filter section that allows one to dial in different tones within a particular model. And the piano library is expandable with 1GB of memory. The organ section uses the C2D engine, and a rock organ is quite handy in a variety of situations. The sample library allows for classic Mellotron sounds as well as a variety of others. The one section from the Stage that is missing is the independent A1 synth (similar to the Lead). Personally, it is the section I use the least, so I wouldn’t miss it if I moved over to the Electro. Plus, this model would be a little bit easier to schlep back and forth to gigs. The Electro 6 comes in three models: 61-key and 73-key semi-weighted with mechanical organ drawbars; and the “HP” version with 73 fully weighted keys and LED drawbars. As a pianist, the latter would be my preference. Sam Sam has decided that the space under the studio console is an excellent napping spot. This is where the Nord Stage lives when not gigging, and my main Pro Tools HDX station for music recording and CatSynth TV post-production. I am loath to move her when I find her there, so I usually just wait a little bit. After all, even napping cats rarely stay in one place for long. I have been busily preparing for tonight’s solo set at The Lab here in San Francisco. As usually happens, I initially plan to simplify the setup, but then as I work on the set musically, more instruments and equipment end up part of the rig. And this one may be one of the largest to date. In addition to the Nord Stage (aka “The Big Red Keyboard”), there is the newly reconfigured modular synth, the Prophet 12, the Moog Mother 32, Casio SK-1, and iPad. The modular path features multiple voices, including some processing external audio from the Nord and the SK-1, respectively. Why so big? Well, it comes out the current musical direction, which mixes jazz and funk with experimental electronics. That means a full-size keyboard is always present. And the electronics has to provide rhythmic and harmonic support in addition to timbral support. This always adds significant complexity, but provides for a richer musical experience. Here are the details on the show, including the other acts. I am excited to have a group improv with my friends Joshua Marshall, Jaroba, and Christina Stanley. And the evening will begin with an orchestra of invented instruments from Pet The Tiger (David Samas, Tom Nunn et al.) with dance by Christina Braun. If you are in the Bay Area tonight, please consider joining us. From i_radar (Саксаганского Стрит) on Instagram. It’s been a busy musical time for us at CatSynth. Last week I performed a solo set and collaborative pieces with Amy X Neuburg at the Jewish Community Center in Berkeley. This weekend, I have two more performances, again in Berkeley, as part of Hardly Strictly Personal 2017. It’s a three-day event featuring a wide range of experimental and adventurous music, and benefits EarthJustice and the Homeless Action Center. You can see the full updated schedule, as well as ticket and location info here. Vacuum Tree Head will be playing tonight, and my fusion/experimental project Census Designated Place (CDP) will be playing on Sunday. I have been busily preparing to make my debut on the Roland VP-03 Vocoder in both bands. Needless to say, between that and the various everyday tasks of an adult in San Francisco, we haven’t had as much opportunity to post here. Regular (?) CatSynth pics and more resume next week. Please view the comments for more detail on this photo.